Red, White and Blue Sangria Recipes from Epicurious – Design Your Lifestyle. Independence Day 2016 may have passed by, but the entire 4th of July week is a great time to gather family, friends and loved ones for a party, barbecue or cookout. It’s also the perfect opportunity to reflect on our independence, what it means to be American, and celebrate our heritage. July 4th is also a great time (for our friends of legal drinking age) to celebrate with a fantastic cocktail! But how can you incorporate the 4th of July into your cocktail recipe this year? Peter Salerno Inc. has found the best 4th of July drink recipes around! Leave it up to the fine folks at Epicurious to deliver with their Red, White and Blue Sangria recipes. These July 4th cocktail recipes are sure to please a variety of palates, and they couldn’t be easier to make – or more enjoyable! The 3 Epicurious sangria recipes for Red (Dubonnet), White (Pineapple), and Blue (Cucumber-Vermouth) range from sweet to savory, and will leave your party guests begging for seconds – or thirds! 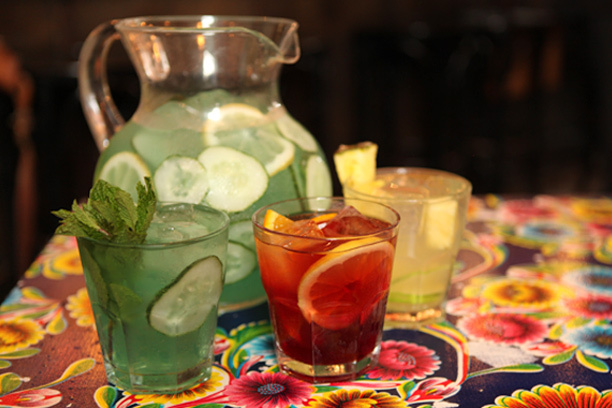 Try serving a pitcher of each sangria recipe this 4th of July, and make your Independence Day party a hit! In a large bowl, combine the orange wedges, lemon quarters, Cognac, and 2 tablespoons sugar. Using a muddler or a wooden spoon, press down on the fruit mixture until the juice is released and the sugar is dissolved. Add the Dubonnet and stir to combine. Strain the mixture into a large pitcher and discard the fruit. Add the orange half wheels, lemon slices, and bitters, if using. Stir gently to combine then cover and refrigerate for at least 2 hours and up to 4 hours. When ready to serve, add the sparkling water, then carefully fill the pitcher with ice and stir to combine. Taste and add additional sugar, 1 tablespoon at a time, if necessary. In a large pitcher, combine 2 cups pineapple, white wine, simple syrup, and rum. Stir gently then cover and refrigerate for at least 4 hours and up to 24 hours. When ready to serve, add the coconut water, lime juice, lime slices, and sparkling water. Add the Maraschino liqueur, if using, then carefully fill the pitcher with ice and stir to combine. Garnish glasses with the remaining pineapple, if desired, or add the fruit to the pitcher. In a large pitcher, combine the lemon slices, cucumber slices, and vermouth. Stir gently then cover and refrigerate for at least 2 hours and up to 4 hours. When ready to serve, add the curaçao, simple syrup, lemon juice, gin, sparkling water, and Maraschino liqueur, if using. Carefully fill the pitcher with ice and stir to combine. Garnish glasses with mint, plus additional lemon and cucumber slices. Thank you to Epicurious for these outstanding recipes! ← 4th of July Weekend: Celebrate Independence Day 2016 in Style!